Hey everyone, I've got another pet product review for you all. This is actually a product I LOVE and have been using for many years. 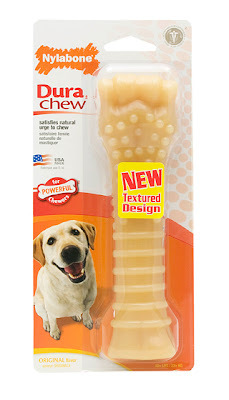 Its a Nylabone DuraChew Bone. There are many shapes and sizes out there so you have to choose the right size and strength for your dog. Until you know which one can handle your pets chomping I would watch them extremely closely to make sure they aren't biting of large pieces that can get stuck in the digestive system. With these items they are not really edible if larger than a grain of rice. For Mr. Todd Ellison I have to purchase the large ones for powerful chewers and they usually last anywhere from three to six months depending on how if he mostly chews the small end only which is usually the case. When this happens the bone tends to end up looking like a prison shank if I let him keep it for too long without replacing it. This can be dangerous because he runs through the house like a bat out of youknowwhere at top speed with the thing in his mouth. That's all I need is to have to explain to my vet how my dog shank'd himself. This product and others like it can be found at places like Petsmart, the local pet food stores where I live and department stores like Wal-Mart. The cheapest price I've found the large heavy duty ones are actually at Wal-Mart for about seven or eight dollars. If you get them at a place like Petsmart the price is going to be almost double. Its totally worth the cash though if you have a dog that likes to chew. When I can't find the kind I like when I'm doing my grocery shopping I WILL actually go down the road and spend the extra cash if Todd's is really in need of being tossed out. Best part is, when your dog chews on the bone the scrapes and indention's made in the bone will help scrape the tartar and plaque off your dog's teeth. And we all know what that means, better breath! I've been using this product for so long and love it so much I have to give it a five out of five. Not the best picture of Mr. Todd Ellison but I wanted to show him enjoying the toy and I wanted to show the chew marks after a few days of chewing. Like I said though, he's a heavy chewer and has some pretty strong jaws to match his breed. This looks great, because my dogs can tear most bones up! Thanks for the review! Maria, I don't know if I would recommend the same DuraChew I use for Todd but maybe for your kitty you could try one of the really small bones for toy dogs or puppies if she does in fact like to chew on things. For your sake I hope she's not just a little biter. The bones they make come in all different flavors too. Todd seems to like chicken. I really don't know how that stuff can taste like chicken but isn't that always the joke? My dogs love these. They tear up all the other toys we've tried but not these. They are awesome!